Locks were (and are) an integral part of railroad operations. A particular company's territory might stretch over hundreds of lonely miles, so the security of its facilities were of utmost importance. Consider how much damage a single misaligned switch might cause, and it's no wonder that railroad companies paid considerable attention to security from the very beginnings of the industry. Railroad locks had to be strong enough to endure harsh, industrial conditions as well as repeated use. They also had to be standardized so that different empoyees could open them, provided they had the proper key. Locks evolved through a progression of styles, from very ornate customized variations to more utilitarian, standardized models. Among the most prized styles are the early "cast back" locks [also referred to by lock collectors as "fancy back" locks] which had ornate, three-dimensional designs cast into the lock body, The designs were usually based on the railroad's initials. Making such locks involved special fabrication and brass casting skills, since each design varied with the railroad. Good examples of such locks with original patina can go for many hundreds of dollars. 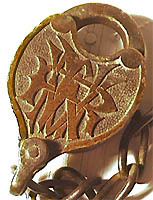 In time, locks evolved to plainer brass models with simple cast initials, and then to standardized, steel models with stamped railroad initials. The steel models were of course subject to corrosion, whereas the brass models just acquired a patina. Value on the collectors market varies accordingly with steel models generally being quite inexpensive to acquire. The shape of railroad locks varied also. "Heart shaped" locks were most common and were typically used to lock switches. A variety of other shapes were also manufactured for such purposes as locking signal facilities and buildings. Generally speaking, collectors consider a lock to be a railroad lock only if it is marked for a railroad. As with lanterns, "railroad style" locks could reasonably have been used in industrial operations of a non-railroad nature. Railroad locks of a variety of styles are shown below. A hearty thanks to all who contributed photos and comments. Above Left. A brass lock from the New York, Susquehanna & Western. Above Center. A brass lock from the Butte, Anaconda & Pacific Railway. Photo by Jack Lucas. Above Right. 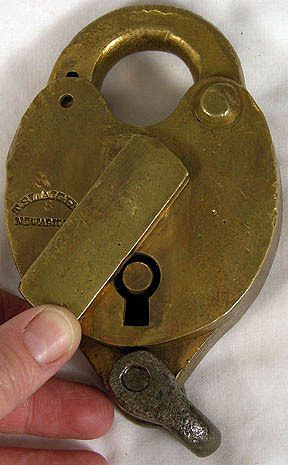 A brass lock manufactured by Fraim and marked for the Pennsylvania Railroad. Right. 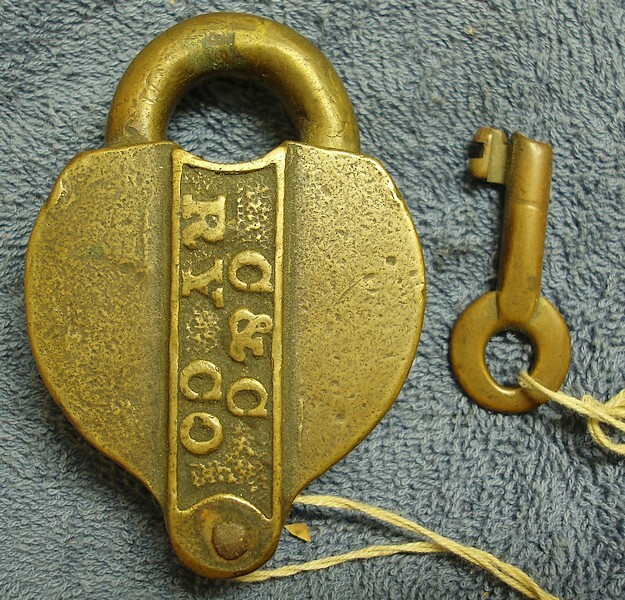 A similar (but not identical) brass lock manufactured by Fraim and marked for the Pennsylvania Railroad. This version has a different background for the letters. Click on the image for a larger image. Above Left. 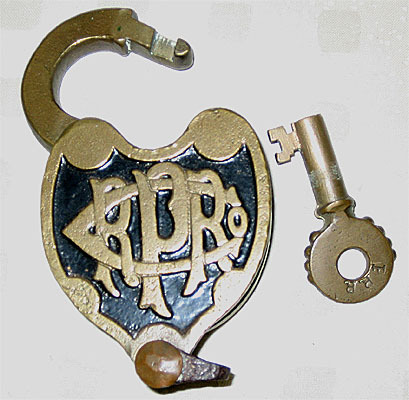 A brass lock from the Southern Pacific Railroad featuring the company's "sunset" logo". Above Center. A Yale signal lock marked for the Wabash Railroad featuring the company's "flag" logo. Photo by carman@ccp.com Above Right. A "screw key", pre-civil war lock manufactured by Elijah Ricard and was used on the Baltimore & Ohio Railroad. Photo by Bill Kajdzik. Above Left. A New York, Ontario & Western Railway brass lock made by Climax. Photo by Roger Schmorr of WR Auctions. Above Left. A Keen Kutter brass signal lock from the "Santa Fe" Railway. Photo by Dean Cross. Above Right. 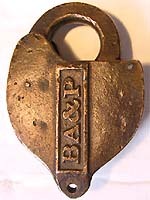 A "castback" brass lock from the Northern Central Railway. Photo by John Mowrer. Above Left. A cast brass lock and key from the Carson & Colorado Railway. Photo by Donald Kosur. Update: We received some email suggesting this was not from the Carson & Colorado, so there may be some controversy about what these initials stand for. Hello, The latest: "To start off, there were many C&CRR's and C&CRY's. The lock pictured is not from the Carson and Colorado Railroad, guaranteed. It matches none of the locks found along the Carson and Colorado in lettering or lock style. The key is not even close to the two known key bits for the Carson and Colorado. I would like to know how this lock was attributed to the Carson and Colorado. Why wasn't it attributed to, for example, the Cleveland and Canton, the Coal and Coke, the Columbia and Cowlitz, or any of the more than a dozen C&C's listed in Railroads of North America by Gross? Thanks. - Dan." Above Center and Right. A large car seal lock marked for the Atlantic & Great Western Railroad. The small hole in the second view indicates that this is a car lock. It weighs in at 26 oz. Photos by Gary Moser. Click on the images for larger versions.